According to the American Academy of Implant Dentistry (AAID), more than 30 million Americans are missing all their teeth in one or both jaws. Many millions more are missing at least one permanent tooth. When it comes to finding the best solution for replacing missing teeth, dental implants have become the “Gold Standard” at Soams Dental for replacing missing teeth. Dental implants can permanently restore your smile, but they do much more than just replace missing teeth. Here are four ways dental implants will improve your life. 1. You can eat what you want. Dental implants restore your ability to eat a variety of different foods without the discomfort or chewing limitations imposed by tooth loss. 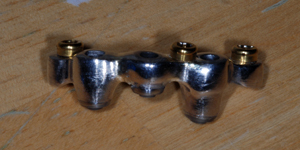 Dental implants are made of titanium and are attached directly to your jawbone. They act as anchors to hold natural-looking porcelain crowns in place. They look and function just like your natural teeth. 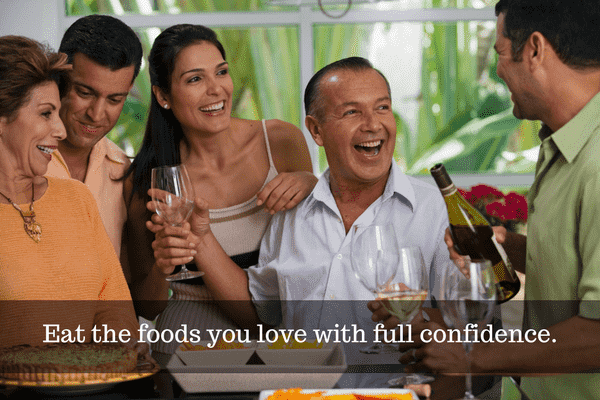 So, no need to skip eating any of the foods you love! 2. They protect you from further tooth loss and bite misalignment. Empty spaces created by lost teeth can result in the movement of other teeth causing bite misalignment. Implants stop those neighboring teeth from shifting and guard against bone loss which can lead to tooth loss. When a tooth is missing, the bone in the jaw loses the support that had been provided by the tooth root. Over time, the bone will begin to deteriorate. Dental implants directly mimic the missing tooth root, supporting the jaw bone and halting the deterioration of bone. 3. They will restore your confidence and self-esteem. 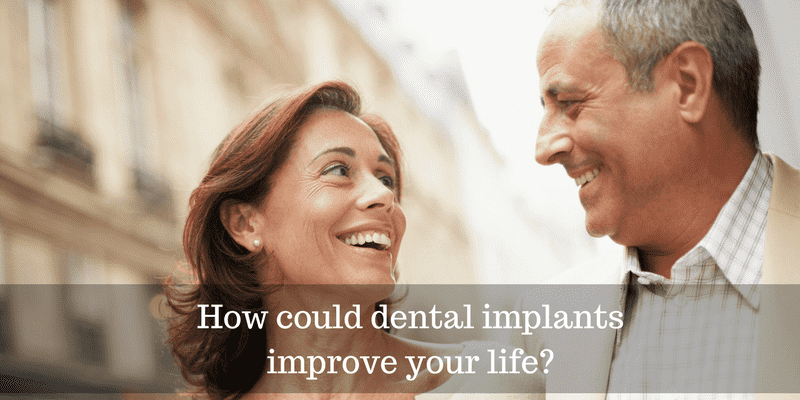 Implants restore your ability to smile naturally and confidently. When you’re proud of your smile, you’re far more likely to share it with others – which can go a long way in boosting your self-esteem and quite possibly your business and social relationships. 4. 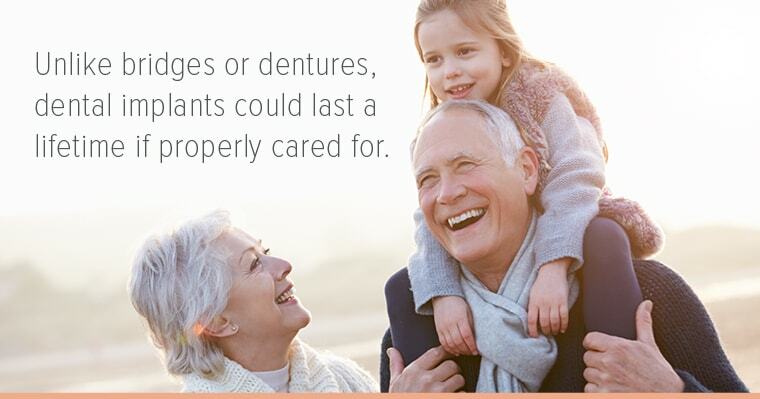 They can securely anchor your dentures. Dental implants can be used to anchor dentures firmly in place, giving you greater comfort and more confidence in your smile. 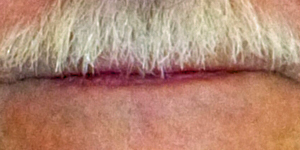 Dentures that slip are more than an embarrassment; they are a danger to your oral health. Unintentional movement isn’t just embarrassing— it can cause serious damage. The friction that results from a loose denture plate can create sores. These not only cause you discomfort but also put you at risk for infections. With implants, you can speak, eat, and laugh without worrying that your dentures will slip or come out. 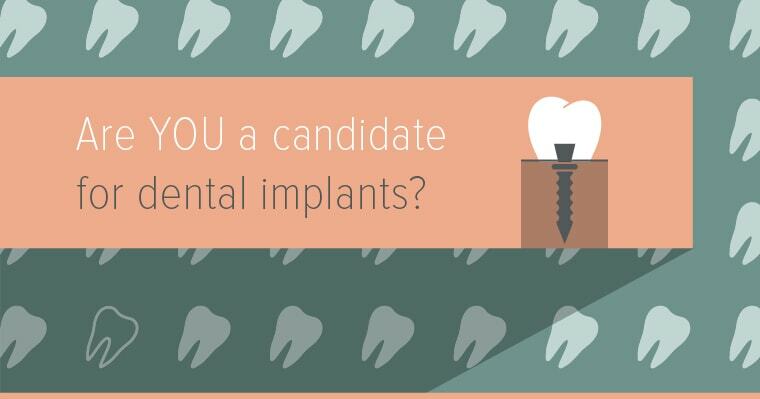 Do You Have More Questions About Implants? 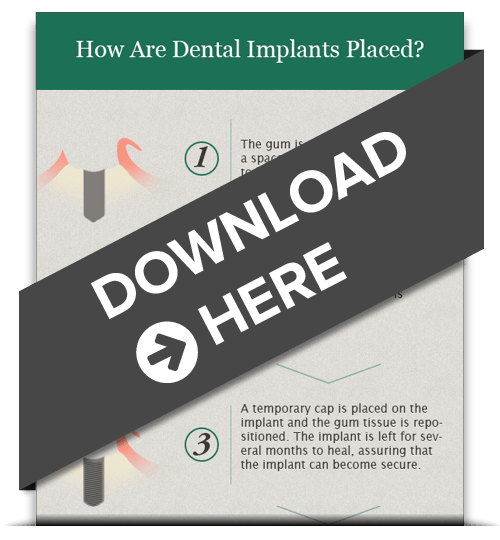 We know you must have other questions about implants, so we created this informative infographic. 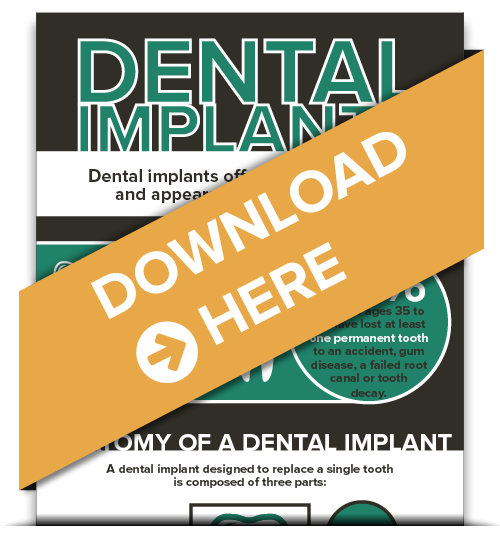 It will give you the information you need to decide if a dental implant is the right choice for you. Just fill in the form and click on the “Download Now” button! Why not call our office at (203) 743-1972 or contact us online and talk with Dr. Gerfen about whether dental implants would be a good choice for replacing your missing teeth. Take the mystery out of dental implants. We thought about what you would like to know and created this digital download with informative step-by-step graphics. Thank you again for being the greatest patients on the planet! See you at your next appointment with our expert in dental implants, Danbury, CT dentist Dr. Gerfen. The Man Who Wouldn’t Smile! Losing your teeth can be traumatic. Not only is it impossible to eat or chew comfortably, but social situations can become painful and embarrassing. Convention dentures have long been the established solution for tooth loss. But, it certainly hasn’t been the ideal solution! Slippage, chafing, and inability to chew or eat normally are just a few of the drawback. Dentistry has long needed a better answer to the problem of missing teeth. Dental implants is that answer! Implants are replacement tooth roots that are permanently placed in the jawbone and then crowned with a natural looking and functioning custom-crafted replacement tooth. Implants are often used to replace a single missing tooth, but they are increasingly being used as the stabilizing foundation for dentures. A recent patient of ours had experienced the discomfort that missing teeth can cause. It was hard to even get him to smile. Implant retained dentures were the perfect solution for him! Implant retained dentures are held in place by implants strategically placed in the jawbone which along with a prosthesis securely hold dentures in their optimum position. • Look and function like your own natural teeth. • More comfortable and stable than conventional dentures. • Have a more natural biting and chewing capacity. • Implant retained dentures also protect your supporting bone structure from deterioration. • They are easier to maintain than conventional dentures. 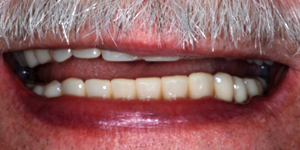 Our patient loved his new smile using implant retained dentures. In fact, we can’t get him to stop smiling now! Don’t suffer any longer from the discomfort or embarrassment that can be caused by missing teeth or ill-fitting dentures. We would love to talk with you about the options available for a long-lasting, beautiful, and comfortable smile. Contact us or call us at (203) 743-1972 to make an appointment to learn how you can have a smile that won’t quit with dentures retained by dental implants that have our Danbury, CT patients smiling non-stop!